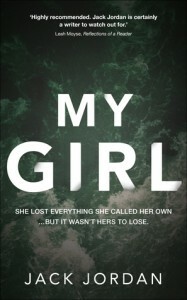 My Girl is a fast paced thriller that just keeps on giving …and giving, even when you think there is nothing left to give! I’m not going to say much about the plot, but it is one of those stories that makes you question how much you truly know those closest to you. You know the saying “crazy in love”, well this book gives that a whole new meaning. This thriller is twisted and full on. Just when you think you’ve thought of everything, something else causes you to gasp and slap your hand across your mouth in surprise. I highly recommend this to readers who enjoy fast paced thrillers and psychological thrillers. I would like to thank the author for allowing me a copy of this book via Netgalley in exchange for an honest review.